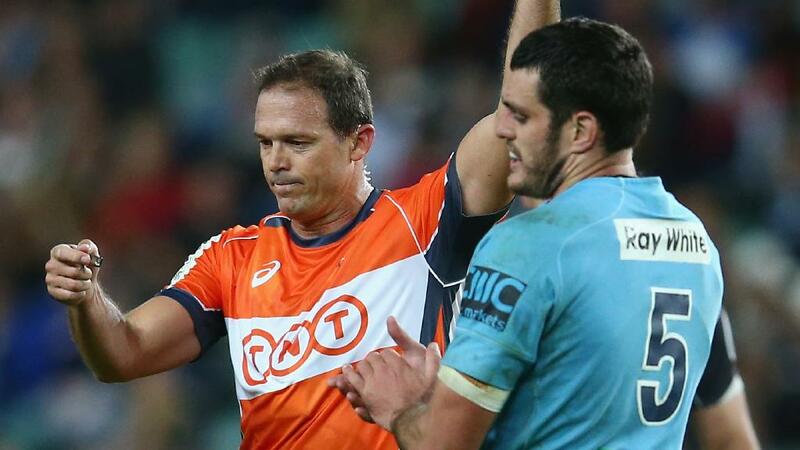 The Referees, Assistant Referees and TMO’s are in the spotlight again. In some cases the officials are not so much in the spotlight as dancing in the crosshairs of some disgruntled rugby fans’ imaginary sniper’s rifle. Some are suggesting that the referees might have cost their team the game and a semi-final slot, others are suggesting that the referee was poor, despite their team actually winning. Over in New Zealand, the Crusaders are looking at their semi-final against the Chiefs with some trepidation. The referee for this game is Glen Jackson. Just two weeks ago the Crusaders were hammered by Jackson in their 31 – 22 loss to the Hurricanes in the last round of the regular Super Rugby season. The loss cost the Crusaders top spot on the overall log and thus the possibility of having to travel to Johannesburg for a final if both they and the Lions prevail this coming weekend. Jackson penalised the Crusaders 17 times during that game, while he only raised the arm 8 times against the Hurricanes. The reaction from Crusaders fans was somewhat South African in flavour as the keyboard warriors launched some pretty nasty attacks at Jackson, alleging everything from plain bias to the possibility of his being bought. His eyesight, intellect, parenthood, and even his status as a New Zealand citizen were called into question. Now the Crusaders must play another game under his management. They must be hoping he has a very thick skin and bears no grudges. In the Brumbies/Canes clash, it was that man Glen Jackson again. He yellow-carded the Canes’ prop Jeffery Toomaga-Allen for contact to the head of Wharenui Hawera, the Brumbies 10. Some felt that the card was overly harsh. Perhaps there is a case to argue that Wharenui Hawera was falling into the tackle and that Toomaga-Allen was already committed, and the high tackle was purely accidental. The current law is quite clear, contact to the head is an offence. Jackson and TMO Ian Smith saw contact to the head and off went the prop. The Highlanders’ fans are also seething with anger after Liam Squire was yellow carded in their quarterfinal against the Crusaders. Squire took out Richie Mo’unga slightly late, after Mo’unga had kicked the ball away. It was a penalisable offence. Replays then appeared to show Squire’s right-arm slide up Mo’unga’s shoulder and strike the back of his head. TMO Glenn Newman got involved. He asked Angus Gardner to have a look at it. A yellow card for contact to the head was the result. Personally, I thought it was a rough call. Skipping on to the last game of the weekend. The Chiefs fans are a little miffed that Sam Cane was yellow carded when he and Michael Leitch thumped into Dillyn Leyds. Once again the TMO got involved, somewhat insistently, telling Jaco Peyper that Cane’s shoulder struck Leyds’ chin and deserved a yellow card. Peyper was more than a little hesitant, but allowed his TMO to dictate the outcome. For me, Leitch’s contact with Leyds was the one which deserved to be reviewed, not Cane’s tackle, yet the officials went the other way. Which then brings us to the yellow card, or cards, issued by Marius van der Westhuizen in the other quarterfinal. The one between the Lions and the Sharks. Sharks supporters are livid with the card given to Stephen Lewies for going offside in the “red” zone, without first issuing a “team warning” for repeated offences in the danger zone. Some are suggesting it was a harsh call, some are even saying it cost the Sharks the game. Perhaps it was a tough call, perhaps it should only have been a penalty? Replays show the Lewies was clearly offside, and that a penalty had to be given. Was the offence serious enough to warrant a yellow card? This is something that only the referee can decide, in the heat of the moment, in an instant. Importantly, nowhere in the Laws of the game is the referee required to issue a general team warning before he goes to the pocket for one of his cards. He certainly did not issue some sort of warning before sending Franco Mostert to the bin in the 61st minute. Van der Westhuizen is also being subjected to some Shark-based opprobrium for some of his other decisions. They are taking about what looked to be an off-the-ball tackle by Courtnall Skosan, at a time when the Sharks were still hanging on to a one-point lead, especially as the Lions eventually moved upfield from there, and where then awarded the match-winning penalty. Right on the final whistle the Sharks thought they had won the ball and were flapping arms and crying to the heavens for a penalty, but Van der Westhuizen saw it differently and awarded the Lions a scrum that ended the game and the Sharks hopes for an unlikely qualification for a semi-final slot. Before I move off the subject I want to give you a quick analysis of the job Marius van der Westhuizen had to do on Saturday. The 2107 version of the World Rugby Law Book, consists of 206 pages of Laws and variations to the Laws. There are 22 laws that take up 143 pages of printed typeface, with diagrams. The rest of the Law book contains variations to the Laws that apply at various age-groupings, or to 7- or 10-a-side rugby. A referee on the Premier Panel is required to know those Laws and all the variations intimately, he must know how to apply them, and when. The Laws are complicated and often contradictory, yet the referee must apply them accurately and consistently. Not a job for the fainthearted. Now we move on to actually applying the Laws during a game of rugby. I have taken the Lions/Sharks encounter as the benchmark for this analysis. During the game on Saturday the two teams made 51 handling errors. The referee had to rule on each of those incidents. He had to make an instant decision on the handling error, whether advantage should be applied, and for what period of time that playing advantage should be allowed. Van der Westhuizen had to manage 18 lineouts and 15 scrums. Each lineout has 42 different penalisable offences where the Law prescribes either a full penalty or a freekick. The referee has to watch for all 42 such offences, while applying the rest of the Law with regard to the throwing of the ball, the catching of the ball, the setting and defence of a maul, the numbers in the lineout, whether the backline is far enough from the line…. It goes on and on. As for the scrums, there are 43 penalisable offences described in Law 20, either a full penalty or a free kick. And neither of Law 19 or Law 20 include the offences described in Law 10 – Foul Play, those that the referee must also watch for when officiating the two set-pieces. During the Lions/Sharks encounter Van der Westhuizen awarded 13 penalties and 1 free kick. Then he had to contend with two teams that carried the ball 204 times, made 264 passes, 17 offloads, formed 144 rucks, mauled the ball 7 times in open play, made 261 tackles, dealt with 35 kicks, 15 lineout mauls, and 24 kickoffs. All of this in the 34 minutes that the ball was actually in play. Consider then that the referee had to make all his decisions in an instant, while running to keep up with the game. He had to manage two teams of professional athletes with mayhem in their minds. He made more decisions in 80 minutes than most people make in a month. And most of those decisions were made during 34 minutes filled with intense activity. Consider too that the referee is required to be a super fit athlete in his own right, with a depth of knowledge about the game and it’s Laws, rules and regulations, as well as a passion for the game he is managing. We require him to maintain the same playing standards we require of the players, yet we do not afford him the same recognition nor the same remuneration. The referee is there to rule over the hundreds of moments that occur during a match. The referee must apply the Law when any one of 30 players makes one of the 125 or so mistakes that are made in a game of rugby. And we do not allow him to make any mistakes of his own? Remember too, that many of our referees are part-timers. There are some that are full-time professionals, but the majority are not. They are part-timers who hold down another job, and this causes all manner of issues when it comes to measuring performance and dealing those who are not up to the required standards. The time has come for Referees and other Match Officials to be recognized for what they are, and what they do in the game, with full-time professional status and reward. Then, and only then, can they be measured on their performance in the same way we measure the players.